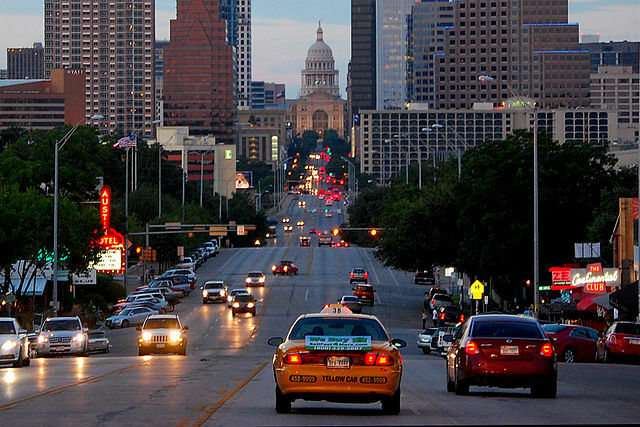 Edwin Waller, the first mayor of Austin, designed Congress Avenue to be Austin’s most prominent street (Texas was an independent Republic at the time, and Congress was named after the Congress of the Republic). By the late 1840s “The Avenue” formed a well-established business district. The mid-1870s introduced gaslight illumination and mule-driven streetcars as well as construction of a new Travis County courthouse at 11th Street. The present Capitol at the north end of Congress was built in 1888. The original dirt street was bricked in 1910, and trolley cars operated on the Avenue until 1940. Before I-35 was completed in the Sixties, Congress was the primary road to reach Austin from the south. Certain landmarks such as the Austin Motel are a legacy from pre-Interstate times.